"Let him wait for me. I'll face him after I'll take care of Sergio Medina on May 5," thus declared Filipino rising star Rey "Boom Boom" Bautista after watching on TV WBO superbantam champ Daniel Ponce de Leon won a highly unpopular decision against Filipino former world champion Gerry Peñalosa at yesterday's boxing event at Mandalay Bay in Las Vegas, NV. The 20-year-old Bautista (22-0 17KOs) is the number one contender to Ponce de Leon's belt and will face number two contender Argentinian Sergio Manuel Medina (28-0 16KOs) on the undercard of the mammoth fight between Oscar de la Hoya and Floyd Mayweather on May 5 in Las Vegas. The winner between Bautista and Medina will face Ponce de Leon. Commenting on the De Leon-Peñalosa fight, Bautista said that Gerry hit De Leon with clean punches all throughout the contest and should have won the fight. "But the problem is," Bautista said, "you have to win convincingly if you're the challenger. And Gerry did not look good when De Leon started to run." Daniel Ponce de Leon, who has been called a 'Raramuri' (No Runner), has developed a fearsome aura enroute to a 30-win-28-knockout record before the Peñalosa fight. He flattened unconscious Sod Looknongyangtoy of Thailand in the first round and disposed American Al Seeger of Georgia in the 8th round in his last two fights. With De Leon's fearsome record and reputation, no one had given Peñalosa any chance to pull out an upset. Add to it is the fact that the smaller Peñalosa had jumped two classes higher to fight De Leon. The betting line in Las Vegas of the De Leon-Peñalosa fight was pulled out because of the insurmountable odds against Gerry. The indomitable Pedro Fernandez of RingTalk.com had posted a challenge at the highly popular Pacland Forum saying that he will eat a piece of paper if Peñalosa defeats De Leon by decision and two pieces of paper if Peñalosa knocks out De Leon. But as the De Leon-Peñalosa fight progressed, it was clear that De Leon could not just run over Peñalosa as he had promised as the slick and highly technical Peñalosa evaded, ducked, slipped, parried and blocked De Leon's 1,400 punches all throughout the night. In return Peñalosa dished out his own well-timed counters that had snapped back De Leon's head many times. 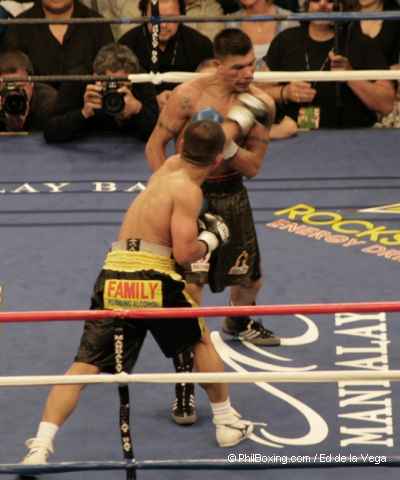 The fight had become real interesting and real close that experts viewing the contest had given Peñalosa a more than real chance of pulling out an upset. Gerry Peñalosa (left) connects with a straight left to De Leon whiskers. Photo by Dr. Ed de la Vega. But as the contest reached the closing three rounds, the deciding rounds so to speak, the 'Raramuri' De Leon did the unthinkable by beginning to run away from the fight and finished the match trying to outbox Peñalosa which may have doomed Peñalosa's chances of winning. You see, 'runners' had always been Peñalosa's waterloo in boxing as he had lost via close and controversial decisions four title fights against hit-and-runners in In Joo Choo of Korea (twice) and Masamori Tokuyama of Japan (also twice). "That's always Gerry's problem," Bautista said, "as a counter-puncher, when his opponent runs, he always finds it very difficult to score." Nevertheless, many scribes watching the contest believed Peñalosa did enough to win the bout or may have lost by a very close margin in far contrast to the highly lopsided scores by the three judges, who have now become the scourge of the sport. The 35-year-old Peñalosa's revenge now lies in the hand of the young Bautista, who had just came from the Church this particular Sunday. "God willing," Bautista said, "I and Ponce de Leon will meet soon."